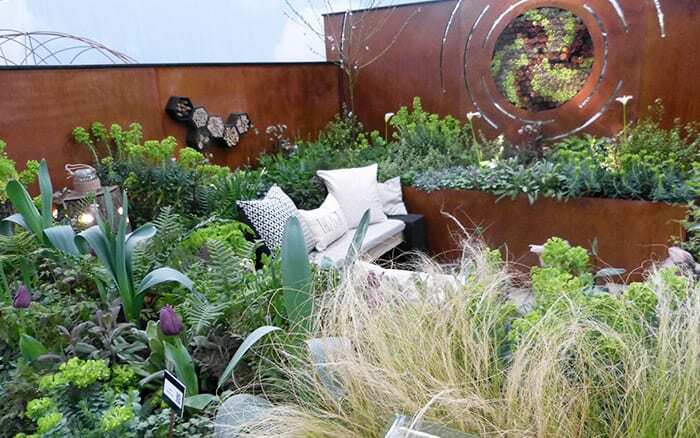 Explore the stunning show gardens from the 2016 Ideal Young Gardeners of the Year competition. 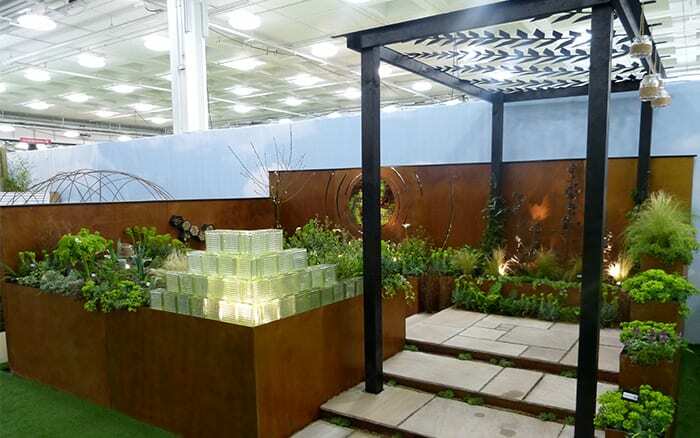 The awards see six of the UK’s top horticultural colleges design and build urban show gardens at the Ideal Home Show at Olympia, London. 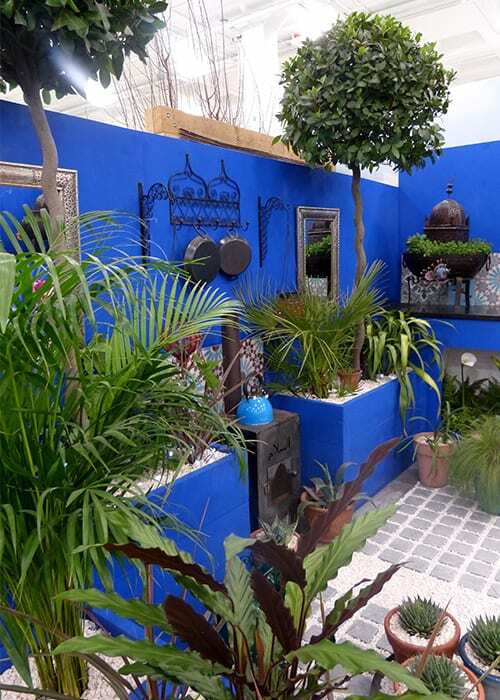 The gardens will be open to the show’s visitors from 18 March – 3 April 2016. 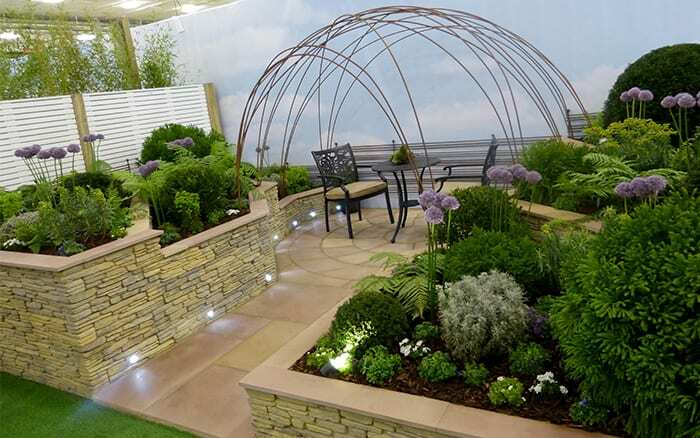 Find out more about the Young Gardeners Competition here. 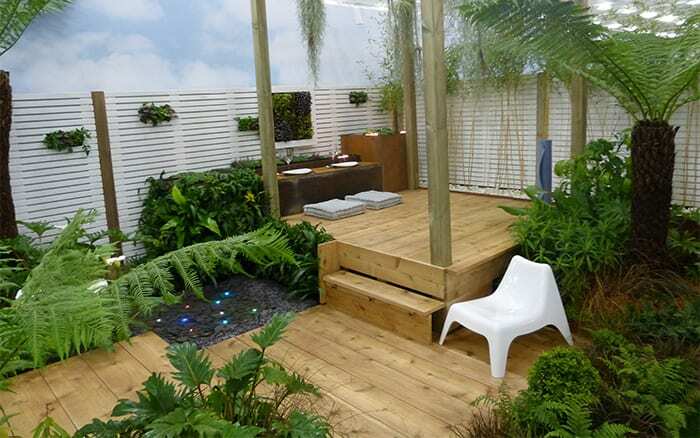 Capel Manor College designed a Wellbeing Yoga Retreat Garden, featuring wooden decking and tropical plants like tree ferns. It had plenty of space to practise yoga and empty your mind. The whole garden had a calming atmosphere, with pools of water filled with lights and candles. 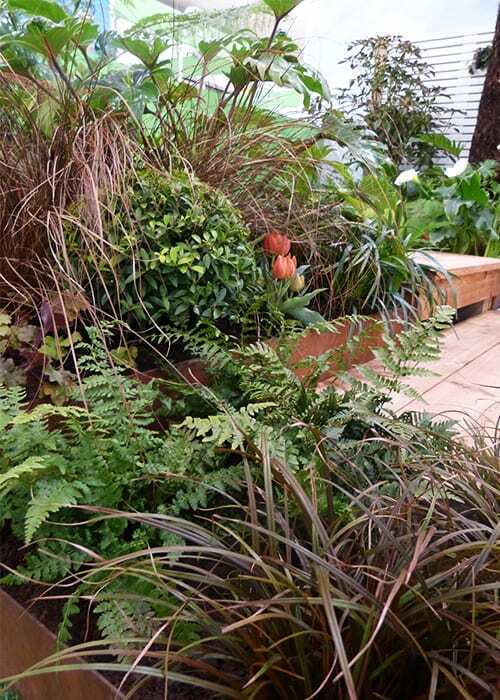 The leafy planting, including ferns and black grasses, was punctuated by orange tulips. Capel Manor College were awarded a Silver Medal. See more about their garden here. 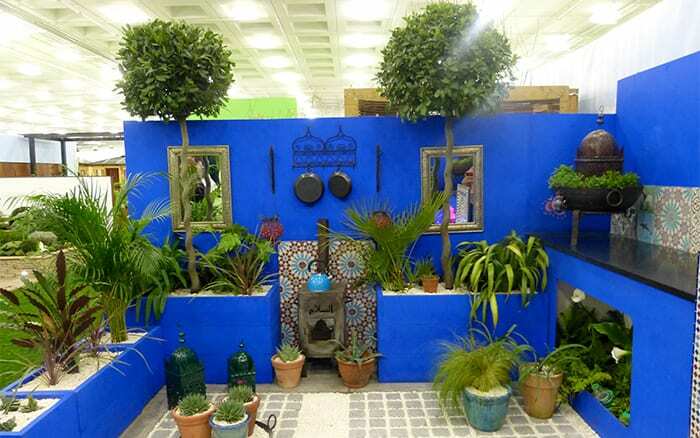 Students from Shuttleworth College created a Moroccan-inspired garden with vivid blue tones from the country’s famous Majorelle gardens. 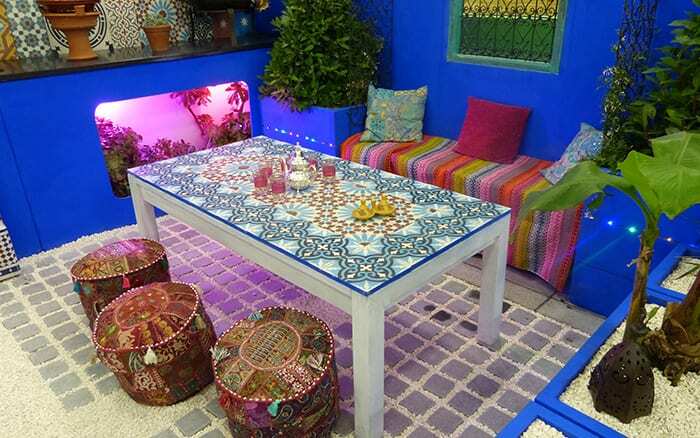 It was set out into four areas, in the Chahar Bagh Persian style, with cobbles divided by gravel. 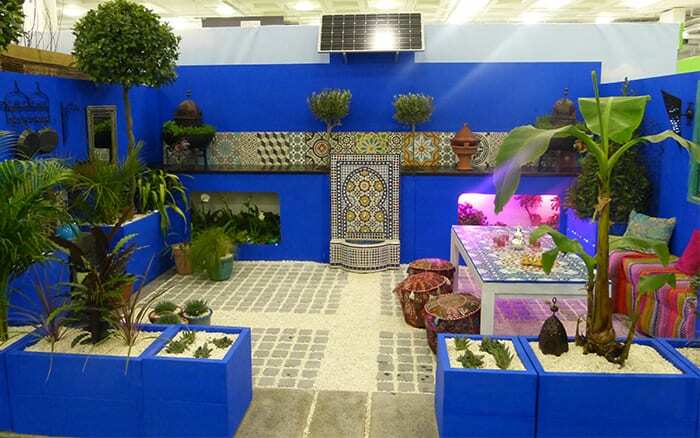 The garden style includes tiled furnishings and decorations, including the seating area and water fountain. 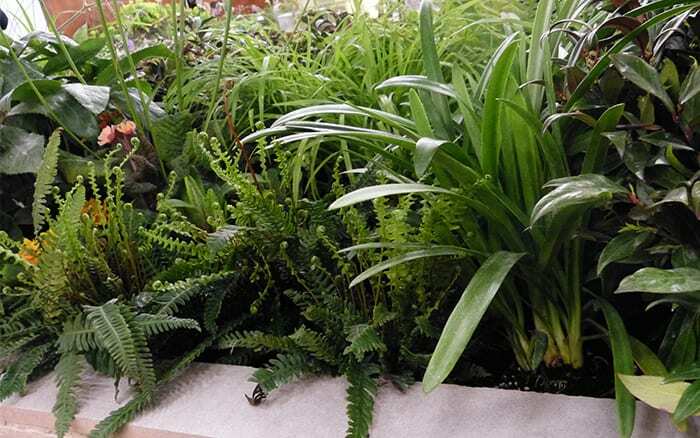 The planting included Mediterranean varieties like olive and yucca, as well as herbs and pyramid bay trees. Shuttleworth College were awarded a Silver Medal. 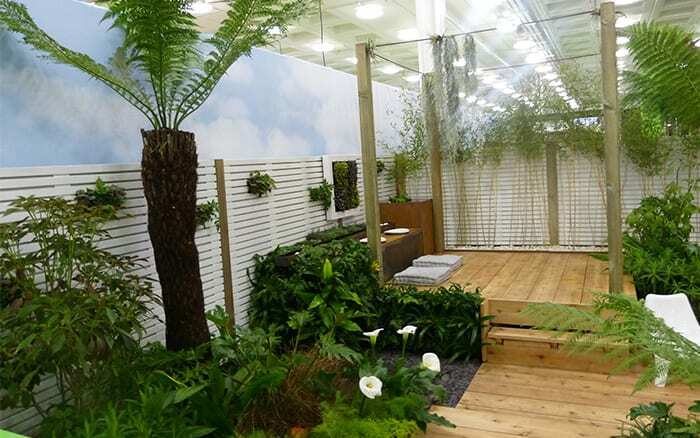 Chichester College students designed a garden around the theme of ‘three’. 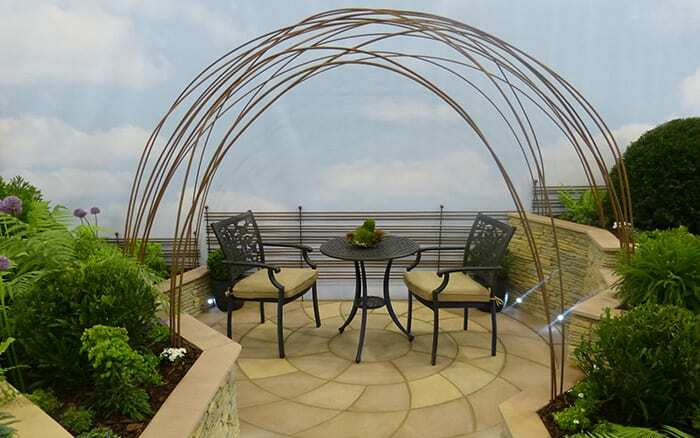 The three raised beds on each side went up on one side and down on the other, surrounding a spiral patio. The seating area sat under a metal dome and the beds are clad in traditional stone walling. 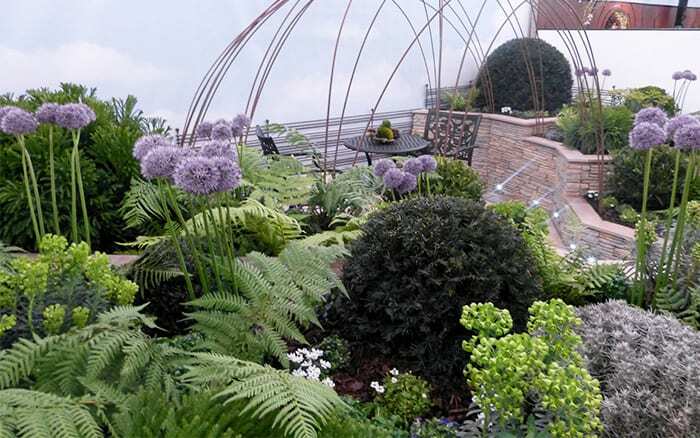 The planting included spherical shapes from bay and cryptomeria, as well as alliums. 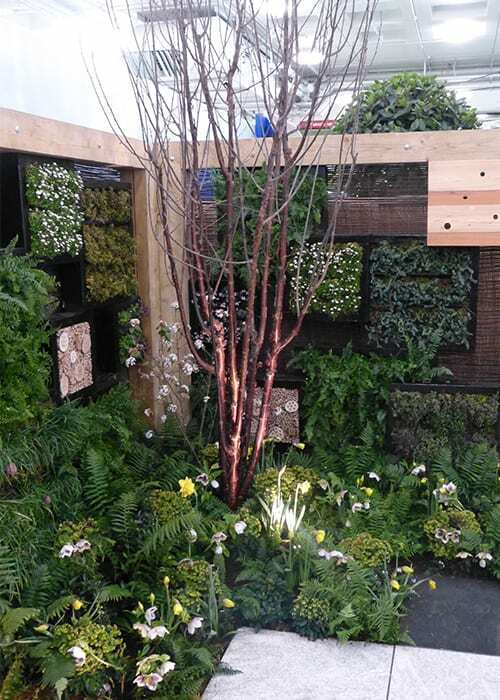 Chichester College were awarded a Silver Gilt Medal. 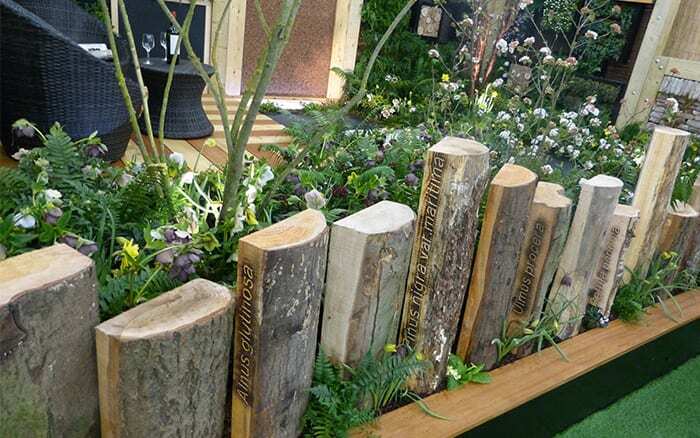 Students from Askham Bryan College designed a contemporary urban woodland garden. 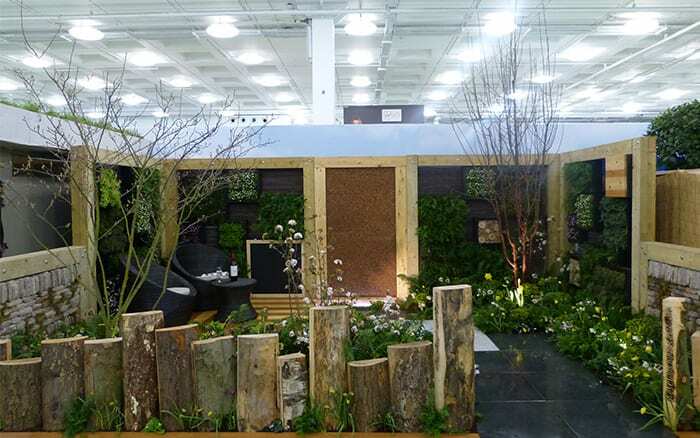 It featured rustic timber, including the stunning wooden fence made from trees felled at a college site. Students carved the tree names into each piece. The planting was a tapestry of woodland colour, including daffodils and hellebores. 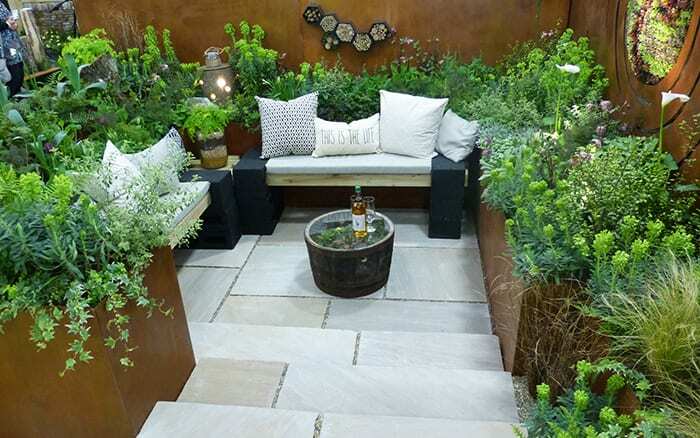 It also featured green wall frames and insect hotels, plus a relaxing seating area with tub chairs. Askham Bryan College were awarded a Gold Medal, and the Best At Show trophy. 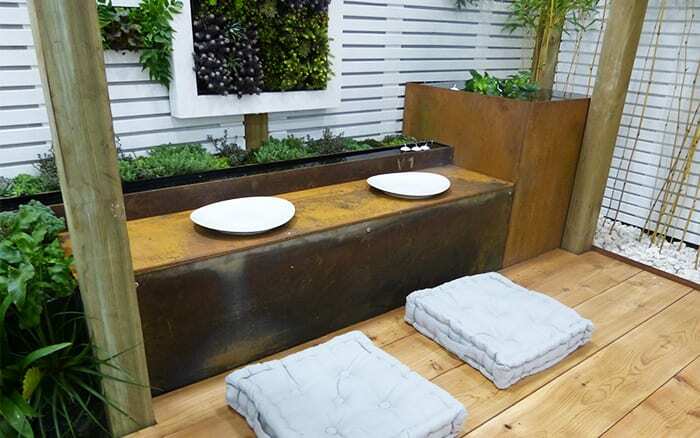 Pershore College students created a garden haven with a secluded sunken seating area. The benches were made with recycled breeze blocks and timber. 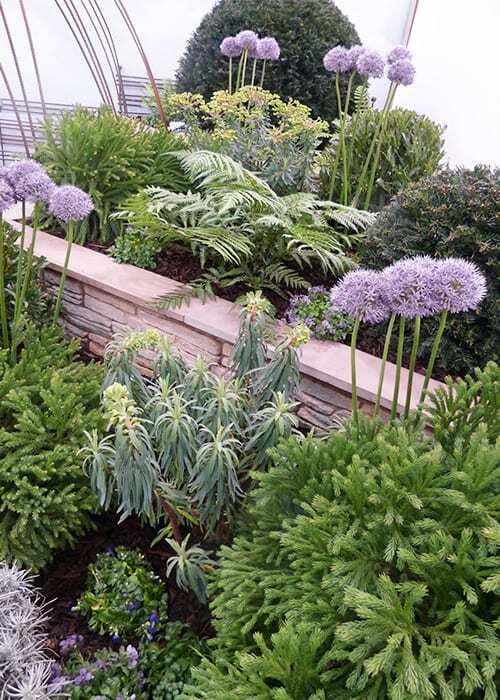 The planting included foliage plants and grasses, plus deep purple tulips. On the wall is a spiral vertical planter of sempervivums. 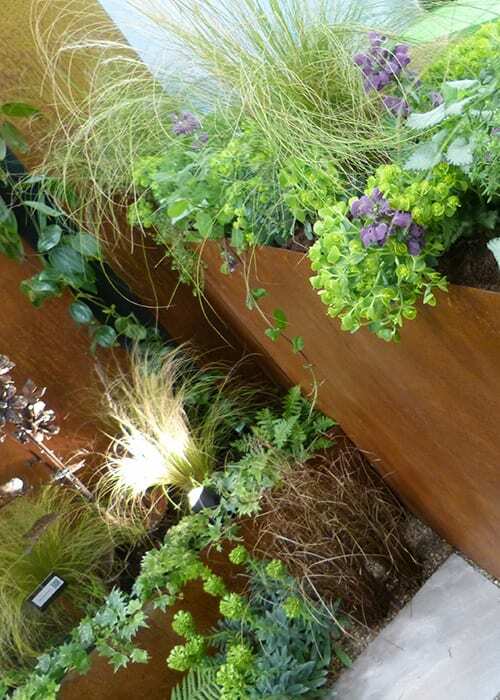 The garden is clad in rusty corten steel and features a black pergola with a fern leaf design across the roof. The plant labels feature QR codes, which can be scanned by a smartphone to direct visitors to an online plant catalogue. 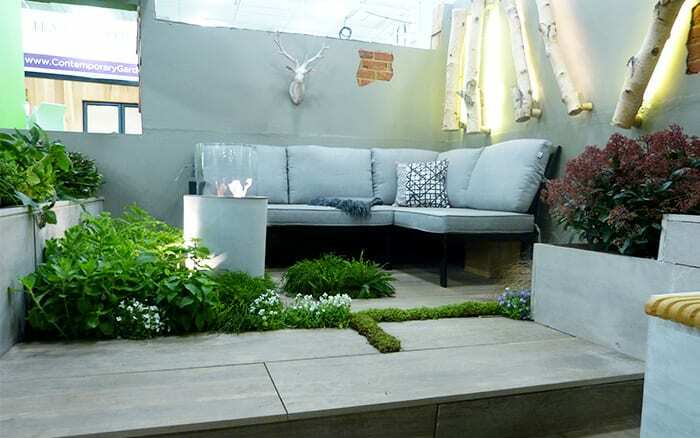 Students from Writtle College designed a basement garden under a green roof planted with meadow grass and young trees. 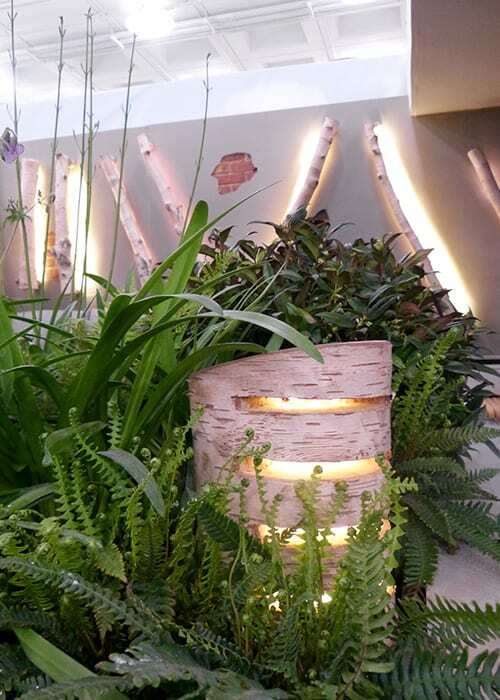 The garden features clever lighting, including recycled silver birch logs transformed into wall lighting. More silver birch light logs dotted the planting. 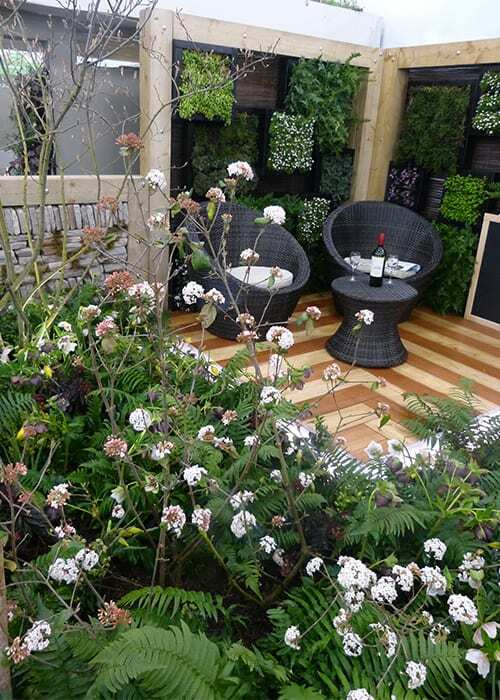 The plants included leafy and tropical varieties with pops of colour, and a huge feature rhododendron. 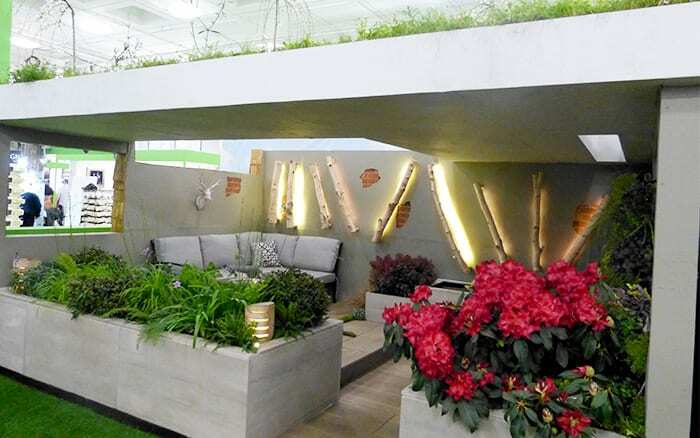 The relaxing seating area looked towards the green wall, which was testing a method of producing electricity from plants. Writtle College were awarded a Silver Medal.